Do Your Agents Have a Trust ‘Issue’ with their Clients? Do your agents have a trust ‘issue’ with their clients? (Look for the Trust Evaluator link below. Use it with your agents to test their ‘trust quotients’–great meeting topic). We’re always telling our agents to ‘work smarter’, not harder. Yet, what does that mean? For one thing, in this low-trust world, it means creating highA�trust as a foundation for any sales action and decision. 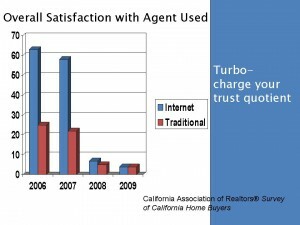 Yet, in the ‘on fire’ market of the past, agents didn’t have to work very hard at creating trust. The market forced decisions and the consumers ended up buying from an agent they may not really know. Those days are over. Do you know how much more it costs to get a new client than to keep an old one? Marketers tell us 6-9 times more. So, it’s just good business sense to train your agents to create high trust with clients for return and referral business. Salespeople can’t sell anything to anyone without first establishing an exceptional level of trust–an increasingly difficult thing to do. The ten tips below shared on in a recent radio show help sales professionals build a ‘platinum level’ of trust. Here are 5 tips, with special comments to you as a leader–in blue. Are you teaching them Neuro-Linguistic Programming (NL))? Are you working with them to pace and mirror in interactive workshops? 2. We believe what others say about a salesperson, not what the salesperson says about themselves. Use testimonials; check evaluation websites to see what consumers are saying about you. Are you checking out what the consumers are saying about your agents on the web? 3. Create an after-the-sale survey and use it consistently. If therea��s something wrong, fix it fast. Do you have an after sale survey that you send out from the office? How do you handle surveys that are less than stellar? 4. We believe what we see, not what we hear. Show, dona��t tell. Use visual presentations consistently. Are you working with your agents to practice showing evidence? 5. Flip your sales presentations. Ask questionsa��lots of questionsa��first. Educate. Finally, sell (well, you wona��t have to sell). 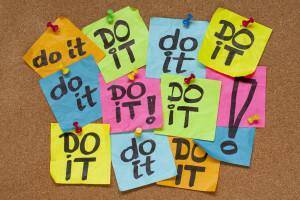 Do you have a planned presentation you teach agents–and have them practice until they are ‘killer’? Click here to get your Trust Evaluator. Many brokers call their agents their a�?customersa��. We thought that, by calling our agents our customers, we would please them, create loyalty and forge recruiting tools. This trend of calling agents a�?customersa�� was a reaction to the old-style a�?father knows besta�� management. Not a bad thought, but, unfortunately, too limiting. We assumed that, if we provided the services agents wanted, everything would be wonderful. How do we put the real consumer first, providing the services that make them so happy they would never leave us? Establish standards of production for your agents. What do you expect of thema��and when? Pretend you are a consumer. Which of your agents would you want to work with? Which of your agents wouldna��t you want to buy a home from? Do you want to step into a better leadership style? Be more effective? Recruit more and better? I’ve created a very special, unique program for managers and owners: Once a month I share a specific leadershp strategy to recruit, choose, train, coach, and retain winners. These are proven strategies to get you out of a rut, take you past crisis management, and energize and inspire your team. See more at 365 Leadership. This new series closes for enrollment March 15. Find out more here. Are you building your online reputation with purpose? A�In the last blog, we talked about how our reputation has gone online–and the dangers that accrue if we stay affiliated with those that don’t represent the best ‘us’. Now, here’s how to build that reputation the best way. Does your company send surveys after the sale? Do you call all those who dona��t return the survey? (Theya��re not mad enough to dump on you, but theya��re probably not happy enough to eagerly complete the survey). Do you fix problems fast? If so, you are in the a�?vast minoritya�� of real estate companies. One Realtor association, the Houston Association of Realtors, has decided to regularly survey consumers on behalf of their members. In just a short period of time, the Houston association has gotten a staggering 47% response rate! I think that means the consumer really, really, wants to tell us what he thinks of us. Don’t have a survey? Click here to get my After Sale Survey. Suggestion: Send it from the office. Or, ask an independent company to send it. You’ll get a much better return rate. A�The hidden, and I think, biggest challenge in real estate today is rebuilding trust. For, without trust, you cana��t form rapport. You cana��t move the sale forward. You certainly cana��t get to a�?yesa��. You cana��t get good evaluations. So, evaluations and action on them need to become a huge part of our sales strategy. Not only do we need to let consumers know what others think of us, we need to make those testimonials available in hard copies, on our website, in our blogs, and in these new sales agent evaluation websites. It was amazing to me, as I read the feedback from consumers, that the agent probably didna��t knowa��or carea��that those very negative testimonials were virtually a�?circling the globea��. Take charge of your reputation now by surveying, coaching your agents, and separating yourself from those agents who are not helping you build your invaluable reputation. Word of mouth is wonderful, but, since ita��s verbal, it is not very memorable and cana��t cover a very wide area. But, Internet postings can stay forevera��either to haunt you or support your reputation. Read the reviews on the sites Ia��ve mentioned in this article. Some of them are from raving fans. But, many of them are from very dissatisfied customers. People Love to Spread their Unhappiness…. You know, too, from experience, that unhappy people are much more likely to spread their unhappiness than are moderately happy people. In fact, the marketers tell us, on average, the unhappy person tells eleven people. Now, with the Internet, unhappy people have a much greater impact on yours and your real estate agentsa�� business and profits. A�The recent survey by the California Association of Realtors shows some stunning and alarming trends about customer service expectations and delivery. In 2005, Internet consumers rated their overall satisfaction with their agent at almost 90%, while traditional buyers rated their overall satisfaction at 37%. However, in the ensuing years, the ratings have plummeted. 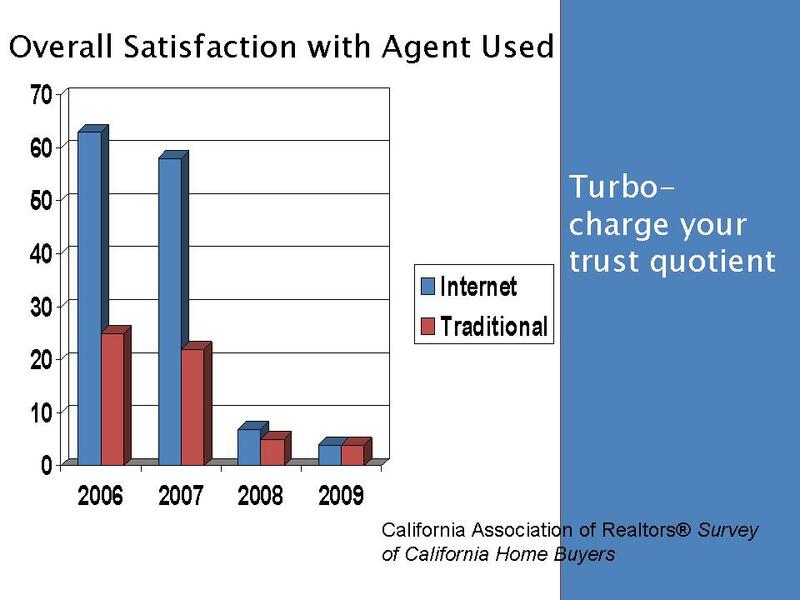 In 2009, both Internet and traditional buyers only rated their overall satisfaction with their agent at 4%!A� (The ratings of Internet and traditional buyers now are equal). In other words, consumer expectations of what an agent should do for them are just not being met. 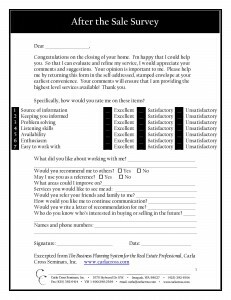 A�In my next blog, I’ll provide you a survey you can use to gain great testimonials–and fix any problems fast. 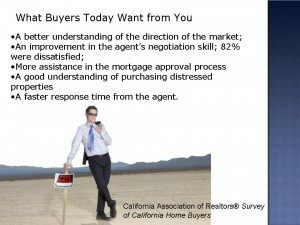 Real estate managers: What do buyers really want from your agents? Yes, we can guess, but, do we really know? As some of you know, Ia��ve been a musician almost all my life. From the time I was four, I was a�?tickling the ivoriesa��.A�A�As you can imagine, Ia��ve been through countless examinations, ratings, adjudications, and contests. Ia��m very familiar with rating systems. One of the ways to get great performance is to know by which perimeters youa��ll be evaluated. A�How Would your AgentsA�Rate a ’10’? A�As you can see, consumers expectedA�agents to be experts at whateverA�they were doing. They dona��t wantA�agents to try to help them in areas whereA�they’re not competent (like trying to sell foreclosures without adequate education).A� What does that mean to us? The obvious. 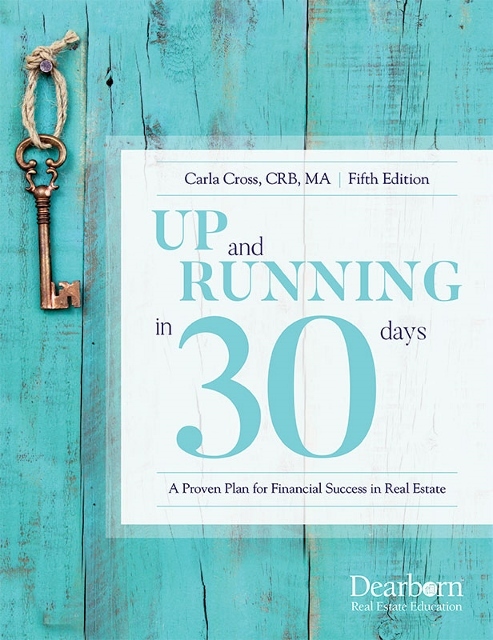 IfA�our agentsA�going to delve into short sales and foreclosures,A� our agents A�need to dedicateA�themselves to becoming an expert. My question to you managers/trainers: Are you specifically training to the skills consumers (buyers) said they wanted from their agents? What does your training schedule look like? Do you have a training calendar that includes these areas? What areas are you training to, right now, that fulfil consumer demands? Are Your Agents Providing What Consumers Want? Would you agree? The more we can fulfill the clienta��s expectations, the more referrals we can expect from that client. A�And, we all know referrals is the name of the game. Referrals cost us much less, and the client referred to us loves us already. Plus, by making the client ecstatic, we have a reason to charge those generous commissions we lovea��and we should. You may the above question and answer are obvious. But, we should slow down and really think about it. Why? Because the gap between client expectations and general agent performance has, in the evaluation of the consumer, become a chasm. And, unless we can breach that gap, our commissions will keep sliding downward. A�As you read this, stop yourself from thinking a�?inside outa�� (What we like to think about ourselves). I, like you, have spent most of my adult working life as a Realtor. I sold hundreds of homes. I hired, trained, and coached thousands of agents. Ita��s painful for me, as it is for all of us, to look at ourselves from a�?the outsidea��. But, if we want to sustain our practices in the best way possible, we have to close that gap between what we think of ourselves and what consumers think of our practices. We have to think a�?outside ina�� (look at ourselves from the consumer perspective). Take a look at this survey of 2009 from the California Association of Realtors. A�CAR asked buyers to rate the overall satisfaction level with their buyera��s agent. Wow! 4 out of 100! Now, I know thata��s not true of your agents, but, it is what those thousands of buyers rated those thousands of agents they dealt with. Is 4 out of 100 good enough to get referrals? Is it good enough to sustain a�?generousa�� commission levels? I dona��t think so, do you? What do you think the consumer wants that he/she’s not getting? In the next blog, I’ll show you what they said (what they wanted from buyers). Have you ever met anyone who would admit they provided poor customer service? Ia��ll bet not. Yet, wea��ve all stood around waiting in a restaurant to be noticeda��while the hostess or server gossiped with the other staffa��and then seemed as though we were interrupting something important to want to be served! Which Service Would You Recommend? I just experienced a situation thata��s a good example of good and terrible customer service. I wanted a pop-up window on my new website (www.carlacross.com) to invite viewers to get my new eBook, Getting to Yes: Ten Powerful Tools to Bash those Barriers to Purchasing Today and join my newsletter community. So, in May, I ordered and paid for the recommended pop-up. I got a receipt from the credit card company. Thata��s all I got. I didna��t get any follow-up emailsa��no communication. When I got ready to implement the pop-up, the website wouldna��t let me register! So, I emailed AND called the owner. He didna��t respond. I called and emailed again. He didna��t respond. This went on for 3-4 weeks. Finally, I got frustrated and bought a different pop-up. I immediately got a welcome email from the second company. Then, I got 2 more emails. And, I finally got the 4th emaila��all within the first week. Each email thanked me for being a customer and offered me helpful tips. Right after I gave up on that first pop-up, the owner emailed me with the log in information. So, which pop-up do you think I kept, and which pop-up did I ask for my money back? You got it. Customer service is 90% of sales today. I dona��t know for sure, do I, whichA� pop-up will provide the best on-going service. I dona��t know which pop-up is best. But, what I do know, is that, given my experience, the first pop-up isna��t going to help me out if I get stuck! What does your agents’A� response rate say about them? Do they have a a�?professional rulea�� about when you respond to inquiries? Most agents dona��t. In fact, a recent National Association of Realtors survey said that half the Realtors NEVER respond to internet inquiries. a�?How would I like to be treated? How would I like to be answered? What makes me trust a person? What makes me walk away from the product or service?a�? Youa��ve got it. Youa��re on your way to a stellar reputation and business.